DESTINATION: TEL AVIV, TAKE ONE! Hotel Montefiore is hot. A three story renovated Bauhaus building in ‘the heart’ of town, Hotel Montefiore houses small elegant rooms on the top floors and a seriously good restaurant and bar below. Rooms are white with comfortable beds and modern baths. The place has a chic bed and breakfast feel with a friendly and knowledgeable staff. Tell them you are beach bound and they will outfit you with a beach bag complete with towels and sunscreen. The Varsano Hotel is a newcomer in the hotter than hot Neve Tzedek neighborhood. More like staying in your own pied-a-terre, each of the rooms has its own entrance from a courtyard with larger rooms, each with a kitchen, washer/dryer, living area and bedroom. I loved the Smeg refrigerators and Nespresso machine in each room. If you’ve been reading my blog you may have guessed that I’m obsessed with bikes! And Tel Aviv is the latest city to offer bikes for hire from stations all over town. They had just installed the stations when I was there and hadn’t yet put in the bikes. Can’t wait to explore this option when I return. 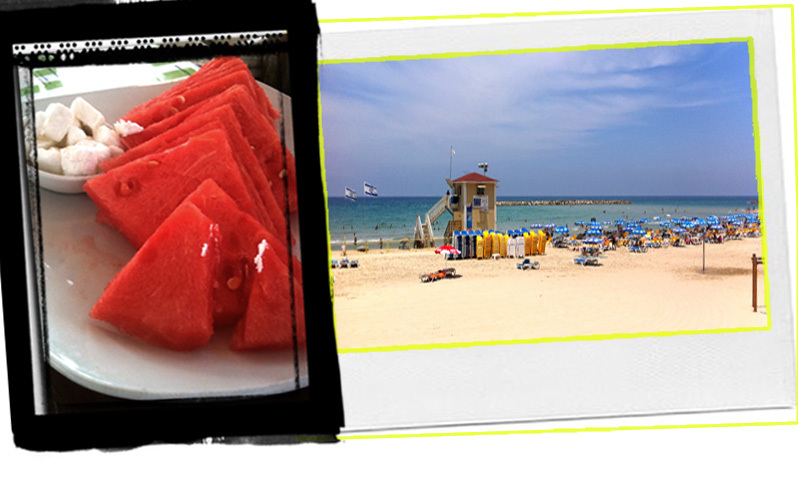 Tel Aviv is all about the beach and there are about a dozen to choose from. LaLa Land is always a favorite with low tables and chairs sitting in the sand under a ceiling of wall to wall white umbrellas. Order fresh watermelon and feta and keep your toes cool in the sand while watching the kite surfers roll the waves. Or play backgammon under the stars. . .
Stroll down Rothschild Boulevard at dusk and take in all the Bauhaus architecture that lines the way. Food kiosks and Petanque ball courts dot the grassy median. Visit Carmel Market to take in all the local sounds and smells. Buy local produce and try a fresh pressed pomegranate juice and a Jerusalem bagel. Adjacent to the Carmel Market is Nahalat Binyamin, a local crafts market. Open two days a week, local artisans come to show their work. I bought my daughter hand sewn soft toys like a telephone, camera, and a tool kit from a former lawyer who was sewing at a machine right on the spot! Looking to get your culture on? Start your evening with a performance by the critically-acclaimed Batsheva Dance Company at the Suzanne Dellal Center for the Arts. I love to wander the streets and find gems tucked away on small streets in the Neve Tzedek. Hafatzim is a beautiful home store there that makes me want to call Tel Aviv home. Jewelry stores abound. COOL FACT: Tel Aviv is know as ‘The White City’ because of its’ collection of over 4,000 Bauhaus buildings. What can I say? I love to eat, and Tel Aviv has some of my favorite restaurants on earth. There are so many culinary delights, I’m devoting my next blog to dining in Tel Aviv! Stay tuned. . .
« DESTINATION: LUCKY MAGAZINE/THISNEXT PARTY (AND GIVEAWAY)!